b. c. Jan. 1695,1 2nd s. of Thomas Pelham, M.P., 1st Baron Pelham, of Halland, Suss. by Lady Grace Holles, da. of Gilbert Holles, M.P., 3rd Earl of Clare. educ. Westminster; Hart Hall, Oxf. 6 Sept. 1710, aged 15. m. 29 Oct. 1726, Lady Katherine Manners, da. of John, 2nd Duke of Rutland, 2s. d.v.p. 6da. (2 d.v.p.). Served as volunteer in 1715 rebellion; treasurer of the chamber 1720-22; ld. of the Treasury 1721-4; sec. at war 1724-30; P.C. 1 June 1725; paymaster gen. 1730-43; first ld. of the Treasury 25 Aug. 1743-d.; chancellor of the Exchequer 12 Dec. 1743-d. 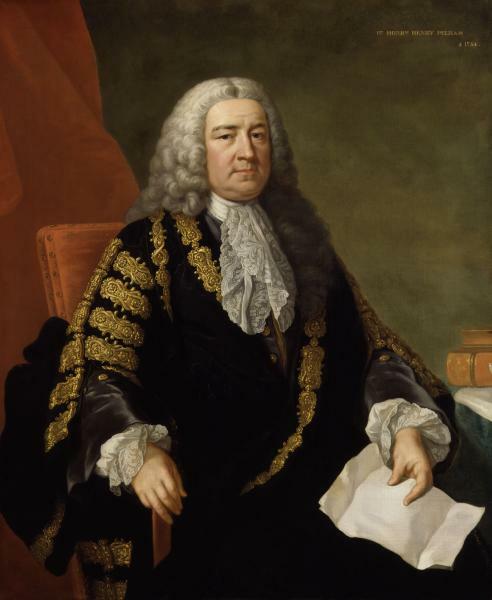 Soon after coming of age Pelham was returned for Seaford by his brother, the Duke of Newcastle, voting against the Government on Lord Cadogan in 17172 but with them on the repeal of the Occasional Conformity and Schism Acts and the peerage bill in 1719. He made his first reported speech 6 May 1720, when the reunion of the Whig party was marked by an address for discharging the civil list debt, which was moved by Pelham and seconded by Walpole. On 15 Mar. 1721 he helped Walpole to secure Sunderland’s acquittal by the House of Commons on a charge of taking bribes from the South Sea Company. 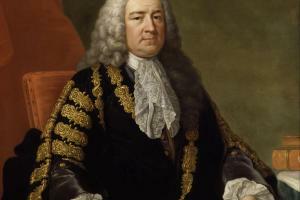 When Walpole succeeded Sunderland as head of the Treasury in April, Pelham exchanged his court post under his brother, then lord chamberlain, for a seat on the Treasury board. In the House of Commons he acted as deputy to Walpole, who eventually adopted him as his political heir-apparent. he was only a chief clerk to Sir Robert Walpole, and why he should expect to be more under me I cant imagine. He did his drudgery and he shall do mine. to have been the author of such a plan as might, in time to come, have released this nation from the vast load of debt they now labour under; and even in my own time to have had the satisfaction of demonstrating to the knowing part of the world that the thing was not impossible. The House of Commons is a great unwieldy body, which requires great art and some cordials to keep it together; we have not many of the latter in our power; the Opposition is headed by the Prince, who has as much to give in present as we have, and more in reversion. This makes my task a hard one, and if it were not for that I should sleep in quiet. that I would never enter into any cabal again to prevent H.M. from either removing or bringing into his service any person he had either a prejudice against or a predilection for. The King is very gracious, civil, and indeed familiar, both at the levee and in the Closet. His Majesty talks very confidentially upon foreign affairs, but is totally silent upon everything at home, and upon all employments that become vacant, upon which H.M. talks to nobody but Mr. Pelham, who sees him but once or at most twice a week, but then he has long audiences ... The truth is, that in fact everything passes through my brother’s hands, and I am with regard to the King as much a stranger as if I was not in the ministry ... Mr. Pelham is much embarrassed, inwardly pleased with his great situation at home and great affluence of fortune, got singly by the Court whenever he leaves it. always had a partiality and regard for the late Lord Stanhope. I know he thinks no minister has made a great figure but him in the two reigns. He will therefore imitate him as far as he can, and, I doubt, if he is not checked by somebody, will bring himself, if not his country, into the same distress that fertile but well-intentioned lord did before him. Of all subjects my brother is the most uneasy when I talk to him upon that of elections. He will do everything himself—he consults none of his friends—he neither has time or patience to give it all the attention, alone, that such a great undertaking does require, and things arise which he did not expect. He is conscious that, nobody being consulted, nobody but himself can be blamed and that is what makes him sore when anything happens. 1. T. Lawson-Tancred Recs. of a Yorkshire Manor, 241. 2. AECP Angl. 226, f. 186. 3. ‘Family Characters and Anecdotes’, by Ld. Camelford, 1781, Fortescue mss at Boconnoc; Hervey, Mems. 120; Yorke, Hardwicke, i. 629-30. 4. Hervey, 945, 949; Coxe, Pelham, i. 83; Yorke, iii. 331. 5. Owen, Pelhams, 160, 190; Coxe, i. 82-85. 6. Coxe, i. 103; Stuart mss 249/6. 7. HMC Egmont Diary, iii. 281, 315; Owen, 211, 272-3, 295; Walpole to Mann, 26 Nov. 1744. 8. To Newcastle, 29 Sept. 1752, Add. 32729, f. 396; 4 Aug. 1748, Add. 32716, f. 13; 18 May 1750, Add. 32720, f. 348; Walpole, Mems. Geo. II, i. 228. 9. To Newcastle, 9 Sept. 1750, Add. 32722, f. 343; Mems. Geo. II, i. 84-85; Yorke, ii. 116-17; Owen, 319-20; Namier, Structure, 195-6. 10. Owen, 319; Coxe, Pelham, ii. 371; Yorke, ii. 12; 17 Oct. 1753, Add. 32733, f. 81; Dodington Diary, 141, 150-1. 11. L. S. Sutherland, ‘The City of London and the Devonshire-Pitt Administration, 1756-7’, Proc. Brit. Acad. 1960, p. 148; Mems. Geo. II, i. 371; Mems. Geo. III, i. 40; Chesterfield Letters, ed. Bradshaw, iii. 1419.